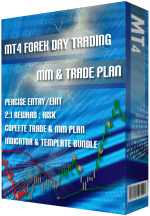 A complete Day Trading indicator package for the Metatrader 4 platform, plus a PDF guide, aimed at teaching you how to incorporate solid money management rules (MM) and trade plan while day trading. Start controlling your risk today! Proper money management and trade plan are the foundation for successful trading. You will learn how they play a key role in the presented day trading system and how to apply them in your everyday trading. You will also learn how you can easily raise your account balance and at the same time lower your drawdown. The files will be sent to your PayPal e-mail address directly after completing your purchase. Please make sure that you provide a valid e-mail address! The author of this page and its content is not responsible for any loses, misunderstandings, omissions or missing information of any kind. All investors are advised to build their understanding of the Forex market from various sources before making any investment decisions. This is neither a solicitation nor an offer to Buy/Sell currencies, futures, stocks or options on the same. No representation is being made that any account will or is likely to achieve profits or losses similar to those written on www.the-forex-strategy.com and www.az-invest.eu.